Skin tags are generally small flaps of flesh that are just a few millimeters in size. Sometimes, people don’t even notice they have them for this reason. Unfortunately, not all skin tags are tiny. Some growths can be up to two inches in size. That’s about the size of a grape (or bigger). How easy is large skin tag removal at home? If you have a big skin tag on your face or body, it will present additional problems. The good news is that in most cases you can still remove it. You just need to make sure that what you have is a benign growth and find out about the safest methods that can be used to perform the procedure. You can get it done by a doctor (recommended for massive skin tags) or at home (for skin tags that are bigger than average). The most important thing to keep in mind is that skin tags are harmless. If one starts out small but keeps getting bigger, there is no need to panic either. They can get bigger due to more blood flowing to the growth. It’s likely just due to some form of irritation. A skin tag that has gotten bigger doesn’t automatically mean you have another health issue. Some people worry that a huge skin tag means it’s cancerous, but that isn’t true. But, depending on where the growth is located, it can cause problems (and embarrassment) if not removed. 1.1 Why Do Skin Tags Grow Bigger? 1.2 Do I Have a Cancerous Skin Tag? 1.3 How Do Doctors Remove Skin Tags? 1.4 What is the Best Product for Removing Skin Tags at Home? 1.4.3.1 Can I Cut Off a Skin Tag at Home? 1.5 Will My Skin Tags Grow Back? 1.6 What is the Best Way to Get Rid of a Large Skin Tag? This guide will focus on the safest methods to remove large skin tags. We’ll also answer common questions that you will likely have about bigger skin tags. For the most part, you can treat these growths the same way you would any other skin tag, but there are a few differences. Sometimes, larger ones should be examined, and additional precautions need to be taken. Or, they may take longer to treat. Why Do Skin Tags Grow Bigger? Skin tags can grow larger or become blood-filled, but there is no need to panic. There is no concrete reason as to why skin tags form. But, research suggests that they can be caused by friction. This includes skin rubbing against skin, or rubbing against other objects, like clothes or jewelry. For example, if you have a big skin tag on your back, it could be because the shirts you wear (or the chair that you’re sitting in at home or work) are rubbing against the skin. As the friction continues and more blood flow goes to the area, a skin tag can form and continue to increase in size. Skin tags seem to appear in areas of the body that experience a lot of friction, especially the folds and creases. You may not notice a small growth in specific areas, like a skin tag under the arm until it becomes larger. That is often the time when people take action to correct the problem. Do I Have a Cancerous Skin Tag? A common concern is that there might be something wrong with your skin tag. If it is growing larger, it doesn’t always mean that you need to get a biopsy – unless you have a history of cancer or it’s in your family bloodline. Instead of looking at the size of the skin tag alone, you should look at other symptoms and signs to determine if something might be wrong. It’s important to note that complications are extremely rare (provided that the condition has been diagnosed accurately). Even if you experience these symptoms, there isn’t always a problem. If they come on suddenly, though, you should definitely see your doctor. Make sure the growth you’re dealing with is a skin tag. There are several different types of benign skin growths that can occur on the body. 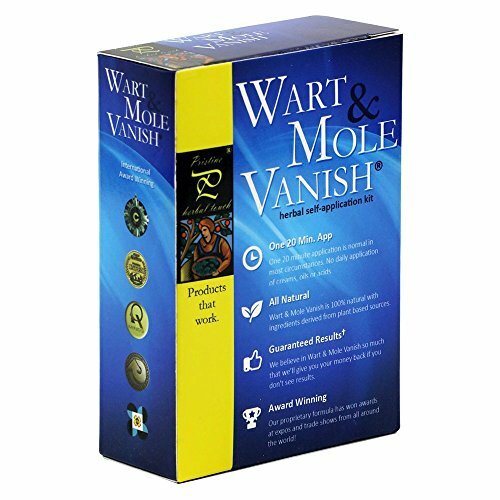 Some of the most common ones are warts and moles. Sometimes, people can confuse these growths for one another. You may not know if a skin tag is cancerous unless it is checked out by a doctor. If you do have the symptoms above and are worried about it, a dermatologist can remove the skin tag and perform a biopsy on it. Whether you want a skin tag removed to get tested, or for cosmetic reasons, you can ask your dermatologist to do it for you. Keep in mind that unless there is a medical reason for it, insurance doesn’t cover the cost of skin tag removal. It’s considered a cosmetic procedure and can get expensive quickly. But, if you have one or two unsightly growths you’d really like removed, getting them done professionally is an option. Cauterization – Your dermatologist will use a cauterizing device to burn away your skin tags. Cryotherapy – Liquid nitrogen is used to instantly freeze skin tags, killing them right away and allowing them to fall off. Surgical removal – A scalpel is used to cut off each skin tag at the bottom of the stalk. They are outpatient treatments that are safe and quick. Because it’s expensive, many people understandably turn to affordable at-home methods. What is the Best Product for Removing Skin Tags at Home? There are over-the-counter skin tag treatments, as well as DIY methods and remedies. As you might expect, some of these treatments work better than others. It’s important to know which ones will be most effective. So, what is the best product for home skin tag removal? Let’s take a look at a few of the best/safest solutions. 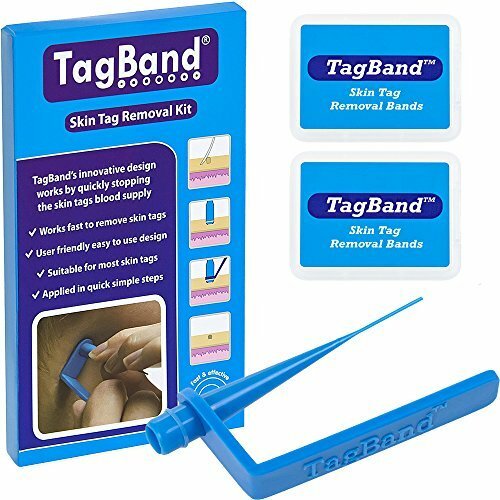 One of the most popular skin tag removal methods is the TagBand Kit. A skin tag requires blood flow and circulation from the body in to survive. Using the TagBand prevents that, and you don’t have to worry about applying any creams or ointments on a daily basis. 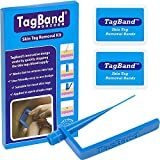 To use the TagBand, you apply a small band directly around your skin tag using the tools provided in the kit. That band will secure itself around the stalk of the growth that’s connected to the body. It needs to be tight enough to cut off blood flow to the skin tag itself. When the skin tag stops thriving, it will start to change color and shrivel up. In order for this to happen, you need to choose the correct size (it’s marked accordingly). There are DIY remedies you can try in place of the TagBand. Some people have seen success by using dental floss to tie off skin tags. This can work well, but it can be difficult to do if you have a growth in a hard-to-reach location. The TagBand makes it easy to tie off each growth, thanks to the tools included in the kit. The DIY alternative is not as safe and hygienic. This is a great method whether you have one big skin tag or several growths. How long does it take for a skin tag to fall off after tying? It can take up to two weeks, but it can take as little as seven days. You only have to use the bands once. Removing large skin tags with tea tree oil is one of the best natural home remedies. 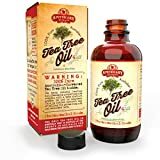 Tea tree oil is one of the most potent essential oils and can be used for a variety of skin conditions, including skin tag removal. It is a natural antiseptic, antifungal, antiviral, and antibacterial solution. Because of its healing properties, it can work in 4-8 weeks. It will definitely take longer than other methods due to the size of the growth that you’re treating, but it’s one of the safest options. You can either use tea tree oil on its own (with a carrier oil) or find a product where tea tree oil is the main ingredient. The drawback is that you have to apply the oil to your skin tag several times each day. Because of this, it’s easy for people to sometimes forget to do it, and that will inevitably slow down the removal process. But, if you’re diligent about using Apothecary tea tree oil on your skin tag each day, it’s an excellent treatment option. The chances of experiencing any side effects are rare, and you’ll be strengthening your skin in the process. If you want to use another method, you can try freezing away your skin tags. It’s not safe to use liquid nitrogen on your skin at home. But, some products contain ingredients that are designed to freeze skin tags immediately. One such product is Compound W Freeze Off. Using a special applicator, you can directly freeze your skin tag in a matter of seconds. This will cause the cell structure to die almost instantly. When your skin tag isn’t getting what it needs to survive, it will fall off on its own when given sufficient time. Many at-home freezing products are marketed toward removing warts. But, they work almost as well on skin tags. It’s probably not a good option if your skin tag is enormous. Most work with just one treatment, but you’d likely need multiple treatments on such a large skin growth. Using a freezing treatment works well under the arms or on the neck. If you have a large skin tag on your eyelid or in the groin area, you shouldn’t use this product. Unfortunately, skin tags can be common in these areas. But, it’s vital to use a treatment that won’t cause more harm than good. You should never use a freezing agent anywhere near your eyes. Can I Cut Off a Skin Tag at Home? One removal method your doctor may do that you should never try at home is cutting off your skin tag. Even if you want to know how to numb a skin tag before cutting it off, it won’t help. It’s not necessarily the pain that would be the problem. It’s the aftermath. First, it’s unlikely that you would have the right tools for cutting off your own skin tags. Everything needs to be completely sterile and sharp enough to remove the growth. It can’t disturb the rest of your skin in the process. The biggest risk, though, comes from bleeding. If you cut your skin tag or are successful in removing it, it’s likely you’ll start to bleed. If you do, you instantly put yourself at risk for infection. It doesn’t take much for dirt, debris, and bacteria to get into an open wound on the skin. If it does, you could create a much bigger problem for you. Cutting off a skin tag at home is not advised. There are much safer home methods that are less painful and less of a risk. 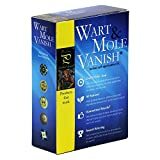 If you want your skin tag gone immediately, you can try a cauterizing cream like Pristine Herbal Touch Wart Mole Vanish. If you’re sure, you want your skin tags surgically removed, always have it done by a dermatologist. Will My Skin Tags Grow Back? It’s a myth that removing a skin tag will cause another to grow back. Could another skin tag grow in the same place, or somewhere nearby? Yes. But, that’s because that area is more prone to this skin condition. The same one won’t grow back, but a new one might appear nearby. If you’ve experienced several big skin tags, it can start to get frustrating when you’re trying to get rid of them so often. Again, there is no sure-fire way to prevent the growth of skin tags. Live a healthier lifestyle. Because skin tags are thought to be caused by friction, people who are overweight may get them more. By losing weight, you may experience less friction in different areas of your body. The fewer folds that are present in your body, the less likely it is that a skin tag will form in that area. Try friction-reducing methods, like powders. Skin tags are common in areas like under the arms, legs, and in the groin area. Reducing sweat and friction in these places can help to lower your chances. Medicated powders or even baby powder can do the trick. Just make sure whatever powder you use doesn’t contain ingredients that might irritate your skin. Avoid tight clothing and jewelry. Again, friction is the enemy when it comes to skin tags. If your skin is constantly rubbing against your clothes or a piece of jewelry, you should avoid wearing things like that as much as possible. What is the Best Way to Get Rid of a Large Skin Tag? If you have a massive skin tag or one that seems to be growing, it’s not uncommon to want to remove it. While It’s not usually necessary, most people don’t like the way that it looks, or find that it becomes irritating. Thankfully, there are many removal options. Whether you choose to have your skin tag removed by a doctor or you do it at home, the most important thing to remember is safety. Your dermatologist can talk with you about the best removal options. But, if you try an at-home solution, take into account where the skin tag is located. If it’s in a sensitive area, certain removal methods may not be appropriate. Never pick or pull at a big skin tag, even if it looks like it’s ready to fall off. If you’re concerned about the way a large skin tag on your body looks, pay attention to the signs and symptoms. They can always be tested to give you peace of mind.